Forty-Eight years ago, Walter LeCroy had a vision: test equipment, when designed correctly, should make any job easier. So with this philosophy in mind, he set out to create a quality product that was both reliable and easy to use. Today the LeCroy Corporation remains committed to Walt’s initial idea, bringing that same level of endowment and accessibility to every product they manufacture. 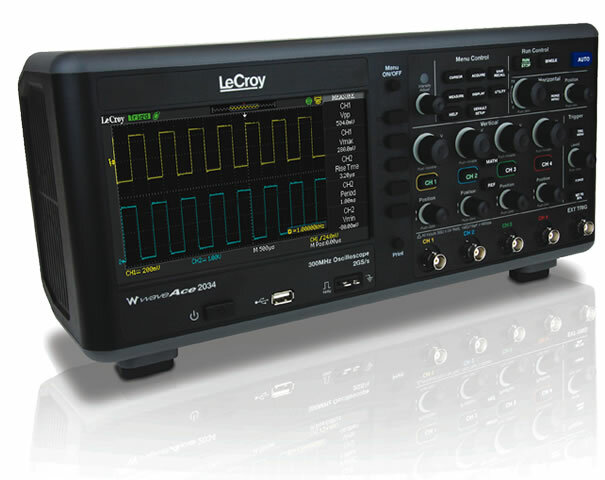 In no unit is this more apparent than LeCroy’s WaveAce line of digital oscilloscopes. The LeCroy WaveAce line has been ranked amongst the best oscilloscopes on the market. Some have proclaimed them sleek, stylish, and even sophisticated. Silicon Chip Magazine proclaimed the WaveAce: a high-end quality entry-level oscilloscope, stating, “LeCroy hasn’t skimped”. Starting this July, you can find the latest iteration of WaveAce Oscilloscopes right here at Test Equipment Connection; that’s right LeCroy’s New Waveace 1000 & 2000 lines have arrived! The New WaveAce 1000 & 2000 feature improved memory and a larger screen than the 100 & 200 models (now 1 Mpts/Ch and 7” respectively) while maintaining the spectacular capabilities that made the WaveAce line Rock. The WaveAce line supports a broad range of bandwidth measurement, from 40 MHz to 300 MHz; with sampling rates of up to 2 GS per second. With advanced Waveform and Math FTT analysis you can measure 32 different parameters automatically which alongside custom triggering can be implemented in a variety of acquisition modes including Real-Time, Peak Detect, and Averaging. Factor in a Multi-Language interface, context sensitive help, as well as USB ports for easy device connections; and you’ve got a digital oscilloscope that’s not only robust but also user friendly. Best of all each unit is also backed by LeCroy’s legendary warranty and support program (which is amongst the best in the industry).